Entertainment Weekly released the first look at Chris Evans in one of the most famous costumes in all of comic books, Captain America. 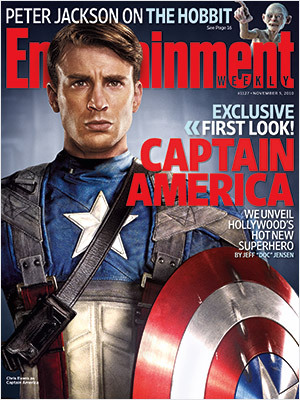 The entire costume is not viewable from the cover of EW, but from the picture, I very much like what I see. The shield looks cool as well. The chinks in it make it look very authentic. If you're a fan of Captain America you have to be happy that Joe Johnston got the costume right. To read the entire article from Entertainment Weekly click on either of the links above. What do you think? Did they get it right?